Dominant Social Theme: We would all be better off without this barbarous metal. Free-Market Analysis: Last year, India’s government made it harder and more expensive to import gold and this article in the Financial Times trumpets the success the government has had in its war on gold. This post was published at The Daily Bell on September 09, 2014. Only fools and the ideologically impaired believe that today’s capital markets are free. In free markets, prices are determined by supply and demand. In capital markets, supply and demand considerations are subordinated to capitalism’s increasingly dysfunctional monetary menses, i.e. credit flows, emanating from central banks. Of all markets, today’s gold markets are the least free. For almost three centuries, gold played a critical role in the bankers’ extraordinarily successful scheme to defraud society by substituting debt-based money in place of savings-based money, silver and gold, by introducing otherwise suspect paper money into circulation via the ubiquitous mechanism of credit so as to profitably skim societal productivity, entrepreneurial ingenuity and constantly increasing government expenditures via constantly compounding interest. In the early 20th century, a negative trade balance beginning in the 1870s exacerbated by the overhead of an aging empire beset by nationalist insurgencies and the military costs of preparing for WWI, forced England to share the care and feeding of its golden goose, capitalism, with its former colony, the United States of America. This was done in 1913 by the creation of a carbon copy of its central bank, the Bank of England, in the US with the enactment of the Federal Reserve Act. The reason given was that the establishment of a central bank in the US would prevent financial crises from occurring in the future as they had in the past. The Federal Reserve System (also known as the Federal Reserve, and informally as the Fed) is the central banking system of the United States. It was created on December 23, 1913, with the enactment of the Federal Reserve Act, largely in response to a series of financial panics, particularly a severe panic in 1907. Only two decades later, the Fed’s loose credit policies resulted in the speculative excesses of the 1920s, i.e. the ‘roaring twenties’, and the subsequent 1929 collapse of the New York Stock Exchange which plunged the US into the Great Depression of the 1930s – a crisis which made the financial panic of 1907 look like a mild case of neurasthenia. This post was published at Wolf Street on September 9, 2014. This month marks the six-year anniversary of the financial collapse of some of Wall Street’s most iconic names. 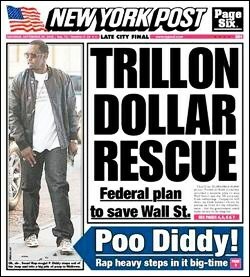 As this New York Post cover of September 20, 2008 memorializes, rapper Sean Combs (P. Diddy) was stepping in dog excrement while the taxpayer was being dragged into something just as smelly – a government bank bailout that would grow to hundreds of billions in on-the-record cash infusions and $16 trillion in secret below-market-rate loans from the Fed. Now it’s September 2014. Six years of crisis studies, hearings, reform legislation, rule-writing, stress tests, living wills, new bank scandals and no jail time for top dogs have darkened the public mood further about both Wall Street and the ability of Congress to meaningfully reform it. Daniel K. Tarullo, a Governor at the Federal Reserve, will attempt to reassure the Senate panel that they have things under control with testimony that the Fed will be imposing capital surcharges on the most Global Systemically Important Banks or GSIBs. Is seasonal gold rise in jeopardy? September typically is a volatile month for stocks, and historically, one of the beneficiaries has been gold prices. In fact, during the past 20 years, gold has climbed more in September than during any other month. However, this year the seasonal effects of September could face some serious headwinds – specifically, from strength in the U. S. dollar. Is it time to hedge our positions? Gold Prices – A September to Forget? Gold prices usually climb in September because, among other reasons, investors are looking for a safe haven for volatility. Gold prices have increased in value 75% of the time in September over the past 20 years, rising by an average of 2.9%. The largest improvement during that time was a whopping 17% climb in 1999 during the month. This post was published at TruthinGold on September 9, 2014. The QE program created substantial hedge fund interest in gold-related ETFs. Unfortunately, QE never created the inflation the funds had anticipated. That’s because commercial banks held the QE money they received, ‘tight to the chest’, rather than loaning it to businesses and consumers. In a nutshell, by enlarging the money supply while GDP was falling, the Fed created deflation. So, if the Fed were to shrink the money supply now, or at least reduce its rate of growth, while GDP rises, and banks start making loans with their ‘QE booty’ at the same time…. is that inflationary? The answer is yes. The taper is inflationary, because it stops the wild growth of the money supply, and does so as GDP grows and wages rise. I’ve labelled 2014 the ‘year of transition’, from deflation to inflation. Most gold analysts are sure gold is either forming a base or a consolidation pattern, but neither scenario really fits with market fundamentals. Sideways price action, for an extended period of time, is what is suggested by the ‘transition period’ fundamentals. Gold’s price action was a bit soft in recent weeks, but not because Western investors are selling or bearish. It’s because demand from China and India is not strong enough to overwhelm mine supply and scrap supply. It’s a case of ‘close, but no cigar!’ Please click here now. This weekly bars chart shows gold is near buy-side HSR (horizontal support and resistance) that sits around the price of $1240. Thanks to the money printing mania of the world’s central bankers, the Wall Street casino has gone global. Accordingly, mindless speculation and momentum chasing have reached new absurdities, as exemplified by the red hot roster of international high flyers below. The financial data for the top name on the list, Twitter, is all that is required to remind us that once again markets are trading in the nosebleed section of history, rivaling even the madness of March 2000. Currently, Twitter (TWTR) is valued at $31 billion. That’s 18X revenue, but the catch is that the revenue in question is it’s lifetime bookings over the 18 quarters since Q1 2010. When it comes to profits, the numbers are not nearly so promising! For the LTM period ending in June, TWTR booked $974 million of revenue and $1.7 billion of operating expense. That why ‘NM’ shows up in its LTM ratio of enterprise value to EBITDA. It turns out that its EBITDA was -$704 million. In fact, its R&D expense alone was 83% of revenues. That’s not the real fantasy, however. The sell-side hockey sticks indicate that TWTR’s forward multiple is only 86.6X projected EBITDA. Let’s see. At its current total enterprise value, this implies it will generate $350 million of positive EBITDA in the next 12 months – or a $1 billion favorable swing from the LTM number. This post was published at David Stockmans Contra Corner on September 9, 2014. The most misunderstood so-called ‘investment’ instrument is gold. Not only by the general public, but even by investment analysts. Even very recently I heard an analyst on CNBC saying gold is valueless, since it doesn’t declare dividends or produce any income. I heard this kind of argument in the ’90s, in reference not to gold, but to technology companies. I could not understand then how someone could look at a company like Intel or Microsoft and say such a thing. These were not uninformed investors but investment professionals with university degrees in finance or economics, an investment certification and an MBA. It made no sense to me. Both companies were already making a lot of money. Finally, one day, one of them completed his statement by saying that it cannot fit the dividend discount model used by the investment profession to calculate value. Since the equation required dividends, if there are no dividends then the value is zero. Rather than going back to the drawing board and finding another equation that fits the real world, they chose to pretend that anything that doesn’t declare dividends is valueless. This is how, today, they can look at gold, that has been exchanged and valued for at least 5,000 years, over most of the planet and by people of different cultures and levels of education, and say it is valueless. I guess that if you ignore reality and live in an imaginary world called ‘nominal’, it is possible. But in the real world gold has value, recognised in time and space. Still, I do not consider gold as an investment but rather as hard cash versus fiat cash (US dollar, euro, yen, etc.) and a store of value. I consider gold mining companies as investments. 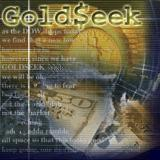 This post was published at Gold Broker on Sep 9, 2014. Treasury Secretary Lew’s comments on tax reform yesterday indicate that in the absence of legislative activity to address the expatriation of US-based companies, the Treasury will lay out its own plans “in the very near future.” Goldman interprets this to mean an announcement in the next couple of weeks. While the substance of the Treasury’s forthcoming announcement is still unknown, Lew’s comments seemed consistent with Jan Hatzius’ expectation that the steps the Treasury will announce will be incremental and not enough to fundamentally alter the outlook for these transactions. Tax-focused activity in Congress is also likely to pick up. Legislation is expected to be introduced in the House and Senate in coming days to reduce the economic incentives for companies to move their tax domiciles. While a vote in the Senate is possible over the next couple of weeks, we continue to believe enactment of legislation on the issue is very unlikely prior to the election. In the “lame duck” session of Congress following the election in November/December, Congress looks likely to pass legislation renewing expiring or expired corporate tax provisions; those bills do not address inversions, but it would not surprise us to see some lawmakers try to raise the issue again in that context. More generally, we continue to hold the view that “something has to give” regarding corporate tax policy. The less the Treasury is able to address inversions through regulation this year, the more pressure will grow on Congress to address next year. Many lawmakers have said they prefer to address the issue as part of broader tax reform, and next year they will presumably have to at least try to do so. There are plenty of reasons that corporate tax reform legislation might not be enacted in the next two years, but the list of reasons it might be enacted does seem to be growing. I believe last week marked an important turning point for the precious metals stocks. After two months of chopping in a tight trading range GDM, which I’m going to us as a proxy for the big cap precious metals stocks, finally broke below the critical brown shaded support and resistance zone. This was a big deal for me as now all those bottoms that had been holding support should now offer important resistance on any backtest. This first chart for GDM shows the two month trading range that one could call either a double top or if you use your imagination you can see a double headed H&S top with a small left and right shoulder. It really doesn’t matter what you call the trading range above the brown shaded support and resistance zone, it’s the S&R zone that matters the most. That S&R zone is now our line in the sand, above is bullish and below is bearish. If GDM is indeed starting a new impulse move lower we should start to see a bunch of black candles forming one below the next. Note all the white candles that formed during the rally off of the June low which told us the move was strong. One last point on the chart below. I’ve labeled the price action below the brown shades support and resistance zone as having a possible reverse symmetry move down which would look similar to the June rally only in reverse. The main thing to keep an eye right now is to see if we get a backtest to the previous support zone at 710 that should now reverse its role and act as resistance. US equity markets are sliding this morning on the back of AUDJPY fun-durr-mentals as the USDollar pushes to new 15-month highs. This has pressed Nasdaq red for September (joining the Dow, S&P, and Russell). Treasury yields are modestly higher but commodities are sliding with copper the worst… makes us wonder if this is follow-through from China’s huge adjustment to CNY overnight. It is Monday afternoon and the markets just closed for the day. As you know, metals were hammered all morning and stayed low. Several old regulars showed up in the comments who seem to only appear on down days. But the frustration levels don’t seem as high as in the past. Perhaps it is we the patient who remain. What a week last week. I should have seen it coming. In fact, Craig warned us it was coming. How is it that I listen to the podcasts and miss his warnings? No don’t answer that one. Well, I thought Friday’s HUI chart for miners looked strong and I didn’t want to be on the sidelines over a long weekend and miss a pop in AU on Tuesday morning. A new Turdite friend expressed my feelings pretty well in a private email: ‘F- F- F- F- F!’ For my part, the frustration was directed at myself. Of course our more experienced traders here will say ‘tsch, tsch, tsch.’ But I know that metals will recover, that this up and down pattern of spec-fleecing that Turd explains to us again every month will continue. Since you may be reading for metals commentary, here goes: This recent beat down keeps us within a down-trending channel that began on July 10th, seeing ups and downs, but staying in a $30 wide channel with just a few false breakouts. I am hoping for a dead cat bounce back up to 1275 to exit my long position, then I’ll seek to buy back after Sept 25. (If you have a good suggestion to buy and hold for this 401K money locked down in this crappy retirement account, I am all ears). Gold continues to trend down, likely to hit 1240 by options expiration at the end of the month. Isn’t that a coincidence– when have we seen this pattern before. The last time we were at that price was a couple of days after the June Options expiration. What better way to discourage and discredit September bulls, fleece the option trading speculator sheep (and me), and generally discourage the precious metal community that was hoping for a big month. I fear it is not to be. As an investor, I impress few. The lessons I have learned have come too late, after I blew out my trading account (16K) in 2008, and after I have cautiously refunded it twice (2K each) and blown it out twice more. I was unable to predict the manipulation moves with just the right timing to trade options. Now that I have learned a few more lessons, I am nearly unwilling to trade a manipulated, Fed-managed market. Even if I make a bit of fiat chasing the FEDs trades, I’ll feel guilty and defeated. Days like this are infuriating, Even if I had been short, my gains do not assuage my fury. This post was published at TF Metals Report on September 9, 2014. While the last thing we would like to do is bring even more attention to today’s grand slam in financial trollery, the following article by the ironically-named MarketWatch author Michael Sincere is just too funny to pass by. Everyone believes the U. S. stock market has reached a permanently high plateau. Everyone, that is, but the bears. Last week’s Investors Intelligence survey showed bearish sentiment at its lowest since 1987 (13.3%). In fact, short-sellers have nearly disappeared along with the few remaining bears. In addition, the VIX is at historic lows (near 12), which reflects investor complacency. Put another way, almost no one believes this market will go down. Wait, “permanently high plateau“? When was the last time we heard that line. Oh wait, nevermind. Several markets seem over-extended and about to reverse their current trends. S&P 500 Index: It bottomed in March 2009 about 670 and is currently about 2,000. The S&P, thanks to QE, ZIRP, Central Bank purchases, and who knows what other contrivances, has levitated to the magical 2,000 level. Will it go higher? I have little faith in short term cycles which can be easily overwhelmed by other forces. I prefer longer cycles as I believe they are more reliable. I think any cyclic analysis should be confirmed with additional technical and fundamental analysis. This post was published at Deviant Investor on September 9, 2014. The price of learning from expensive books: The cost of educational books has soared by 150 percent since 2000 while the cost of recreational books has fallen. There are many reasons why college costs are soaring even well beyond the regular rate of inflation. Schools are adding immense amenities to attract students. Student debt backed by the government allows schools to push prices higher since students simply go into deeper debt with little analysis on ability to pay at a later date. Similar to hospital charging outrageous prices for a standard Aspirin, book publishers realize that they can get away with charging more for textbooks as well. Any college student can tell you that the cost of a college text can eat deep into your budget. Many science books cost hundreds of dollars. Publishers quickly realized years ago that savvy students could photocopy and pass books around. The way around this? Requiring students to purchase access codes in conjunction with the book virtually forced students to always pay market prices for access to course content. So it should come as no surprise to you that since 2000, the cost of educational books has soared while the cost of recreational books has actually fallen. College books are expensive. Yet the cost of going to college has absolutely soared since 2000. In line with the rising cost of higher education students have gone deeper and deeper into debt. Financial aid will first pay off tuition, fees, and other mandatory charges but many students will take a small or large amount more to cover living expenses including books and other materials. Since the debt is there, it is not surprising that publishers have taken advantage of this easy debt machinery. This post was published at MyBudget360 on September 9, 2014. The dramatic rise in support for Scottish independence is nowhere more evident than in GBPUSD implied volatility, which has soared to 3-year highs as The Guardian reports a further poll showing next week’s referendum is on a knife-edge with a gap of just 1 percentage point between yes and no. As one ‘Yes Scotland’ representative noted, “This new Scotland could be less than a fortnight away. But we must not be complacent. The scaremongering, dissembling and misrepresentation of the no campaign will be ramped up as we approach polling day.” Of course, Scotland is not the only EU nation seeking separation, as we illustrate below, and as Goldman Sachs notes, there could be a broader impact on the risk premium across Europe as Scottish independence leads to other calls for more regional autonomy. Macro Factors Dominating Gold Price As US Dollar Outweighs Physical Demand And Investor Flows With gold trading in a narrow range below $1,300 and remaining relatively weak, it is worth pausing at this juncture to look at the combination of factors that are affecting its price formation. 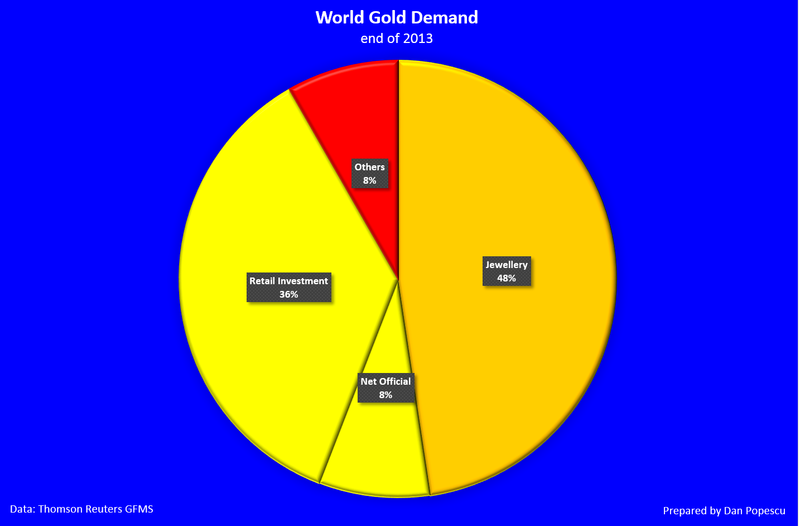 A current snapshot of the world gold market and its near term outlook can be gauged by examining four sets of influences on the market, namely the macro/geopolitical environment, investment demand flows, physical demand in the major markets (using India as an example), and finally the technical picture. Macro Economic/Geo-Political Overall sentiment in the gold market continues to be set by the global geopolitical and macro environment. The relative strength of the US economy compared to other economies is currently creating relative dollar strength, even despite the fact that the monthly US non-farm payrolls for August came in at 142,000 new jobs last Friday, this was substantially lower than the consensus predictions of 200,000. This is because other major currencies are making the US Dollar look good. The British pound is weakening due to the heightened uncertainty over the outcome of next week’s Scottish independence referendum, while last week’s European Central Bank (ECB) cut in interest rates and expectations of sovereign bond buying by the ECB later this year are weighing on the Euro. Therefore, with pressure on the Pound and the Euro, the US Dollar is displaying relative strength. As gold price discovery on world markets is in US dollars, and most pricing and trading is in US dollars, as the dollar strengthens, gold purchases become more expensive for non-US dollar denominated investors. This is just a fact of the market. This post was published at Gold Core on 9 September 2014. Gold is the leader of the precious metals complex! It always has been and it is now. Silver and the mining shares have proven that they will follow the path of gold. If the following charts do not convince you, nothing will. So, study them hard and fast and don’t hesitate. A powerful upward force is preventing gold from making a low below the price of $1,181.40. That is the price where the momentum indicator crossed and turned bullish. That force is being demonstrated by the fact that on every occasion that the momentum indicator crossed over bullishly a new high occurred some months later. Not only did a new high occur but the new high on every occasion touched or went above the rising trend line on this chart and peaked at a Delta Long Term (LTD) high. That is 100% of every bullish crossing of the momentum indicator led to a new high and a peak for this gold bull market at or above the rising trend line and at a LTD high. That is EVERY bullish crossover!! If the 100% performance of gold previously referred to continues we will have a new high at LTD # 5 high or LTD # 1 high or LTD # 2 high. The big, big plus is, if the 100% performance continues, the high will peak at or above the rising trend line. If so, the next gold high will be a minimum of $2,500.00, $2800.00 or $3,000.00. These prices are approximate. Based on this repetitive performance of gold it is virtually impossible for me to be bearish. This post was published at Gold-Eagle on September 8, 2014. About a month ago we mocked the Albanian central bank when reports emerged that “two employees” had been charged with the theft of some $6.6 million in cash from the bank’s vaults. Specifically, back in July the arrests come five weeks after a worker at the central bank admitted to stealing money over the course of four years, taking new bank notes printed in Switzerland when they arrived at his workplace and replacing them with old books. As it turns out, since there is a central bank involved, there is once again more than meets the eye, and the story has since mutated into something far more grotesque than even we could imagine, with news coming out late last week and over the weekend that not only was the theft by “two employees” a misdirection, but that the guilty party was none other than the Albanian version of Janet Yellen, the governor of the central bank himself Ardian Fullani.